Halloween is already upon us, so it’s time to remind folks how to keep all pets (most especially black cats!) safe at this time of year. Many thanks to Kimberly Jackson (A to Z Petcare) and Kate Solisti (KateSolisti.com) for this timely article! Halloween can be scary for our furry friends. It can also be quite dangerous. Here are some helpful tips for keeping your pets safe on Halloween. First and foremost, please do not leave pets outside on Halloween. Vicious pranksters or mean-spirited individuals have been known to tease, injure, steal, and even kill pets on Halloween night. This has been especially true for black cats. 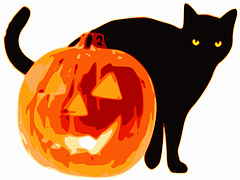 If you have outdoor cats keep them inside several days before and after Halloween to ensure their safety. Keep pets confined and away from the door. Your door bell will be ringing, the door will be constantly opening and closing, and strangers young and old will be dressed in unusual costumes and yelling loudly for their candy. This, of course, is scary for our furry friends. Dogs may become anxious and growl at or even bite innocent trick-or-treaters who they perceive as threatening. Putting your dog or cat in a secure room away from the front door or in their crate or kennel will help relieve their stress and also prevent them from escaping and getting lost. These popular Halloween plants are considered to be relatively nontoxic, but they can induce gastrointestinal upset should your pets ingest them in large quantities. Don’t keep lit pumpkins around pets. Pets can easily knock over a lit pumpkin and cause a fire. Curious kittens run the risk of getting burned or singed by candle flames. Forgo the candle altogether and get battery operated tea lights. Keep wires and electric light cords out of reach. If chewed on, your pet might suffer cuts or burns, or receive a possibly life-threatening electrical shock. This should be true of any day not just on holidays. Trick-or-treat candies are not for pets. All forms of chocolate–especially baking or dark chocolate–can be dangerous, even lethal, for dogs and cats. Halloween candies containing the artificial sweetener xylitol can also be poisonous to dogs. Lollipops and their sticks can be choking hazards and cause a painful obstruction or foreign body ingestion that may require surgery to remove. Candies wrapped in plastic and other types of wrapping can also lead to chocking or cause an obstruction and upset stomach. Symptoms of chocolate poisoning may include vomiting, diarrhea, rapid breathing, increased heart rate, and seizures. If you do suspect your pet has ingested something toxic, please call your veterinarian or the ASPCA Animal Poison Control Center at (888) 426-4435. No Pet Costumes. Please resist the urge to dress up your pet. It might look cute to you, but in reality it could be annoying and unsafe for your companion. If you do decide to dress up your pet, make sure the costume does not constrict their movement or hearing, or impede their ability to breathe, bark or meow. Never leave a pet unattended while wearing a costume. Small parts can become chewed and ingested and can lead to foreign body ingestion which can be life threatening. ID your pets. Always make sure your dog or cat has proper identification. If for any reason your pet escapes and becomes lost, a collar and tags and/or a microchip can be a lifesaver, increasing the chances that he or she will be reunited with you.